there are fewer data points in the middle. Is there a better way to visualize this? 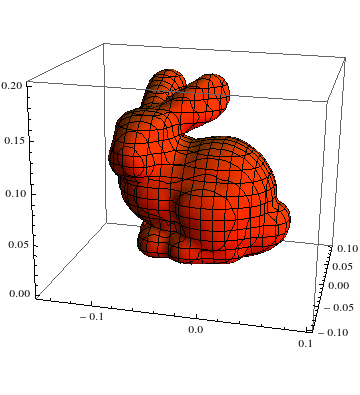 Somehow something like 3d contour plot of the density. If your point cloud is extremely "thick" you can create a RegionFunction. 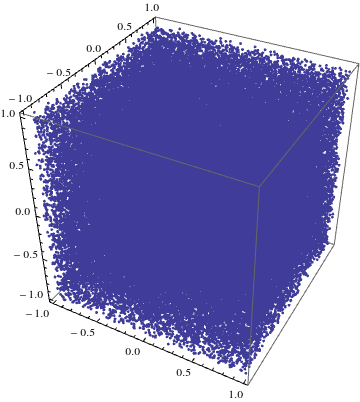 Here is a simple example using points in the cube from -1 to 1 in all directions. This will give an approximation to the boundary enclosing the region. We decide a point is "in" if it is within .04 of one of the points in the original list, else it is outside. I can only guess and an example data-set would have been better. What I would try is to estimate the local density of points and to make a ContourPlot3D (or a RegionPlot3D) which shows you the boundary of certain density. You could for instance (and this is the difference to Daniels approach) calculate the distances from a point x to the next, say 30 points and then calculate the Mean or Median distance. This gives you kind of an estimation how dense x is surrounded by points. Not the answer you're looking for? 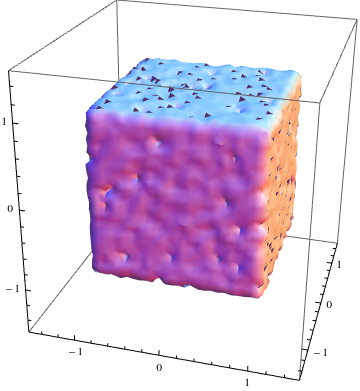 Browse other questions tagged plotting graphics3d visualization or ask your own question. How to visualize several groups of points?